20/10/09 – Acquisition – Canberra, National Portrait Gallery – Born in Turin amidst a French Protestant family, John Francis Rigaud spent the better part of his career in England where he arrived in 1771 at the age of 29. Specialized in portraits and historical paintings, he became a member of the Royal Academy in 1784 ; the work he presented, Samson and Delilah, very much recalls Benjamin West’s art. The National Portrait Gallery in Canberra has just acquired a double portrait by the artist representing the two German botanists, Dr. Johann Reinhold Forster and his son George. They had accompanied James Cook on his second expedition between 1772 and 1775. George Forster returned notably with an account, A Voyage Round the World which became immensely popular. This painting, dated 1780, although painted in England, represents a location in New Zealand. 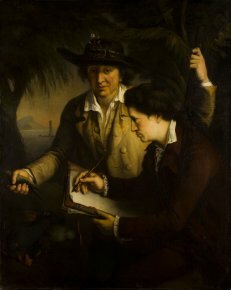 In it, two men are studying the local vegetation while George describes the results of their observations. Rigaud is still not very well known and poorly represented in important museums. In England, the National Portrait Gallery in London holds two portraits while the National Maritime Museum in Greenwich owns five.